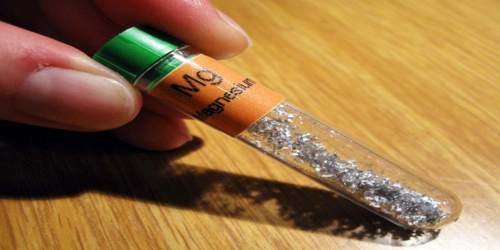 Magnesium (symbol Mg) is a lightweight, moderately hard, silvery-white metallic element of the alkaline-earth group that burns with an intense white flame. Its atomic number 12; atomic weight 24.305; melting point 649°C; boiling point 1,090°C; specific gravity 1.74 (at 20°C); valence 2. 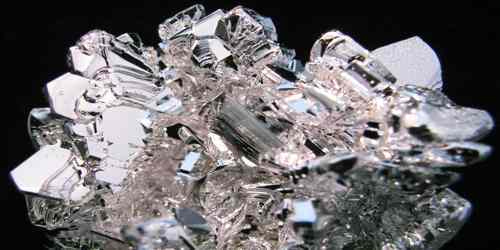 Magnesium is the ninth most abundant element in the universe. It is produced in large, aging stars from the sequential addition of three helium nuclei to a carbon nucleus. It is an essential component of chlorophyll and is used in lightweight alloys, flash photography, and fireworks. The first person to recognise that magnesium was an element was Joseph Black at Edinburgh in 1755. He distinguished magnesia (magnesium oxide, MgO) from lime (calcium oxide, CaO) although both were produced by heating similar kinds of carbonate rocks, magnesite and limestone respectively. Another magnesium mineral called meerschaum (magnesium silicate) was reported by Thomas Henry in 1789, who said that it was much used in Turkey to make pipes for smoking tobacco. 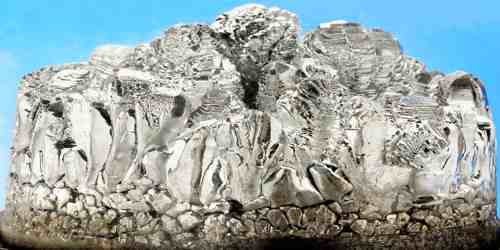 An impure form of metallic magnesium was first produced in 1792 by Anton Rupprecht who heated magnesia with charcoal. A pure, but tiny, amount of the metal was isolated in 1808 by Humphry Davy by the electrolysis of magnesium oxide. However, it was the French scientist, Antoine-Alexandre-Brutus Bussy who made a sizeable amount of the metal in 1831 by reacting magnesium chloride with potassium, and he then studied its properties. Hundreds of enzymes require magnesium ions to function. 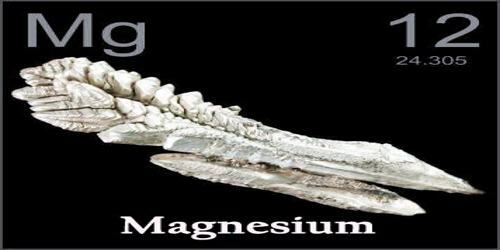 Magnesium compounds are used medicinally as common laxatives, antacids (e.g., milk of magnesia), and to stabilize abnormal nerve excitation or blood vessel spasm in such conditions as eclampsia. Magnesium is the eighth most abundant element in the Earth’s crust, but does not occur uncombined in nature. It is found in large deposits in minerals such as magnesite and dolomite. Its cosmic abundance is estimated as 9.1 × 105 atoms (on a scale where the abundance of silicon = 106 atoms). It occurs as carbonates—magnesite, MgCO3, and dolomite, CaMg(CO3)2—and in many common silicates, including talc, olivine, and most kinds of asbestos. It also is found as hydroxide (brucite), chloride (carnallite, KMgCl3∙6H2O), and sulfate (kieserite). It is distributed in minerals such as serpentine, chrysolite, and meerschaum. Seawater contains about 0.13 percent magnesium, mostly as the dissolved chloride, which imparts its characteristic bitter taste. The sea contains trillions of tonnes of magnesium, and this is the source of much of the 850,000 tonnes now produced each year. It is prepared by reducing magnesium oxide with silicon, or by the electrolysis of molten magnesium chloride. Magnesium is commercially produced by electrolysis of molten magnesium chloride (MgCl2), processed mainly from seawater and by the direct reduction of its compounds with suitable reducing agents—e.g., from the reaction of magnesium oxide or calcined dolomite with ferrosilicon (the Pidgeon process). China is the dominant supplier of magnesium, with approximately 80% of the world market share. China is almost completely reliant on the silicothermic Pidgeon process, which is the reduction of the oxide at high temperatures with silicon, often provided by a ferrosilicon alloy in which the iron is but a spectator in the reactions to obtain the metal. The United States has traditionally been the major world supplier of this metal, supplying 45% of world production even as recently as 1995. Today, the US market share is at 7%, with a single domestic producer left, US Magnesium, a Renco Group company in Utah born from now-defunct Magcorp. Magnesium has the lowest melting (923 K (1,202 °F)) and the lowest boiling point 1,363 K (1,994 °F) of all the alkaline earth metals. It reacts with water at room temperature, though it reacts much more slowly than calcium, a similar group 2 metal. Magnesium is highly flammable, especially when powdered or shaved into thin strips, though it is difficult to ignite in mass or bulk. Flame temperatures of magnesium and magnesium alloys can reach 3,100 °C (5,610 °F), although flame height above the burning metal is usually less than 300 mm (12 in). Magnesium occurs in nature as a mixture of three isotopes: magnesium-24 (79.0 percent), magnesium-26 (11.0 percent), and magnesium-25 (10.0 percent). Nineteen radioactive isotopes have been prepared; magnesium-28 has the longest half-life, at 20.9 hours, and is a beta emitter. Although magnesium-26 is not radioactive, it is the daughter nuclide of aluminum-26, which has a half-life of 7.2 × 105 years. Elevated levels of magnesium-26 have been found in some meteorites, and the ratio of magnesium-26 to magnesium-24 has been used in determining their age. Magnesium is one-third less dense than aluminium. It improves the mechanical, fabrication and welding characteristics of aluminium when used as an alloying agent. These alloys are useful in aeroplane and car construction. It is used in products that benefit from being lightweight, such as car seats, luggage, laptops, cameras and power tools. It is also added to molten iron and steel to remove sulfur. As magnesium ignites easily in air and burns with a bright light, it’s used in flares, fireworks and sparklers. Magnesium sulfate is sometimes used as a mordant for dyes. 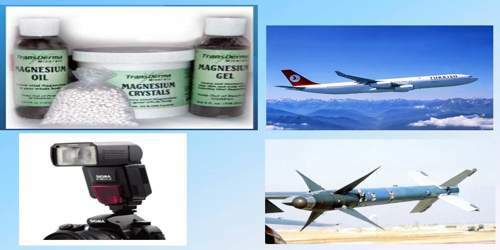 Magnesium hydroxide is added to plastics to make them fire retardant. Magnesium oxide is used to make heat-resistant bricks for fireplaces and furnaces. It is also added to cattle feed and fertilisers. Magnesium hydroxide (milk of magnesia), sulfate (Epsom salts), chloride and citrate are all used in medicine. Magnesium is an essential element in both plant and animal life. Chlorophyll is the chemical that allows plants to capture sunlight, and photosynthesis to take place. Chlorophyll is a magnesium-centred porphyrin complex. Without magnesium photosynthesis could not take place, and life as we know it would not exist. In humans, magnesium is essential to the working of hundreds of enzymes. Humans take in about 250–350 milligrams of magnesium each day. We each store about 20 grams in our bodies, mainly in the bones.